Since Zwift was launched, there has always been the plan to digitise real world race tracks. 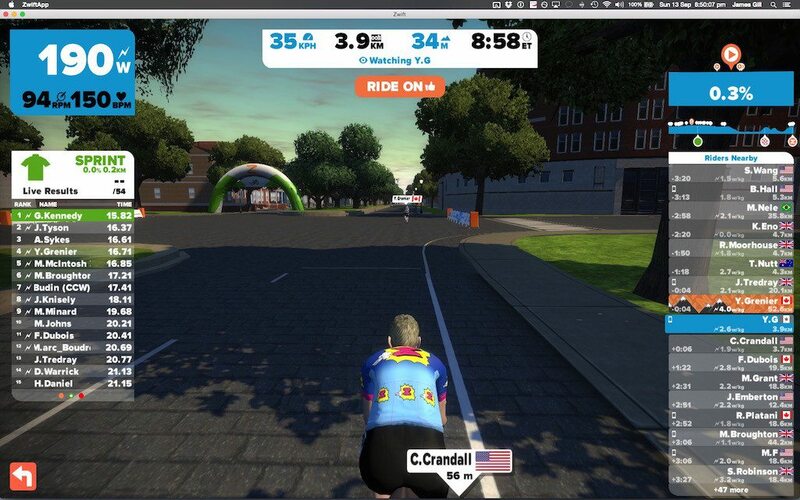 Well after 30 days hard graft at the computer the Zwift team has launched their Richmond course, and now with under a week to go before the start of real world racing at Road World Championships in Richmond 2015, I thought it would be worth while looking at what the Zwift is able to recreate when given a series of GPS coordinates rather than a blank slate. 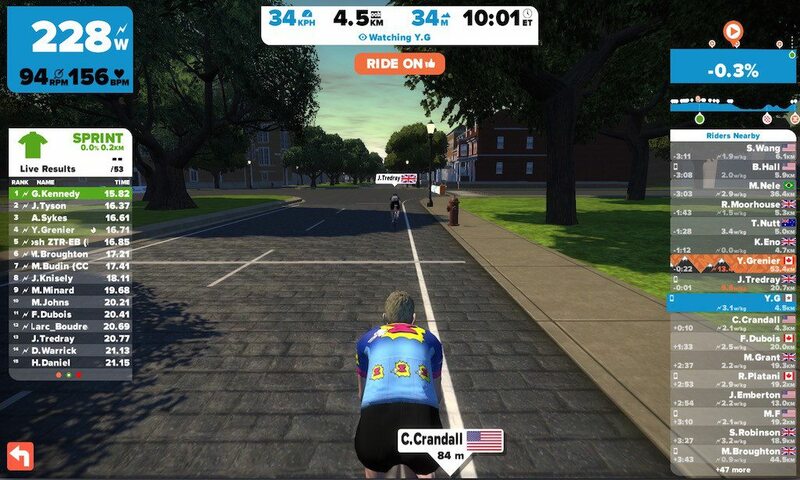 So Zwift have gone beyond Watopia to create a real world course – Zwift Richmond 2015 Road World Championship Course. But there has to be a question as to why? 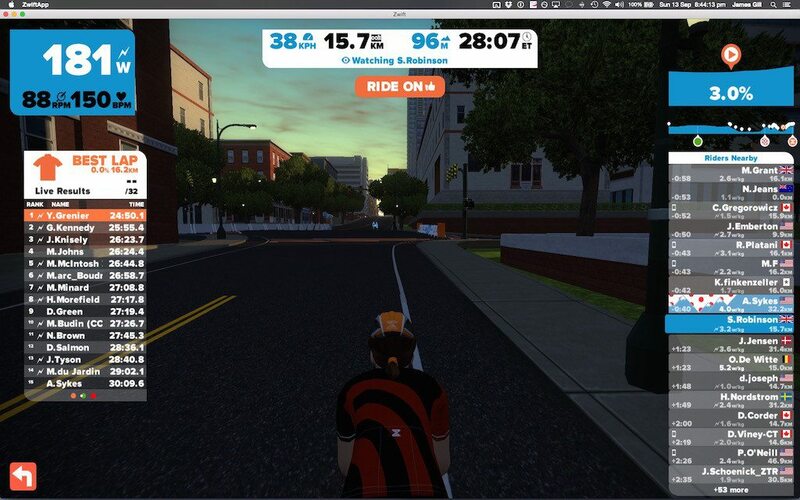 By producing a virtual course of the Richmond Road World Champion course Zwift have shown where a considerable value is to their operation. You are able to train on the Richmond course ANYWHERE in the world as long as you have a smart trainer. As anyone who has a regular ride, part of getting onto the top 10 leader board for your Strava segment is not ONLY about the power of your legs, but about knowing the course. How the road goes up a hill after a long straight, almost TT section, where to keep your legs ticking over, and where to really open up the taps. Previously there would be a considerable cost in terms of hotels, personnel, mechanics etc to travel to a course in advance to practice. In a road course such as Richmond, you are also going to have to deal with cars and pedestrians and other real world hazards. 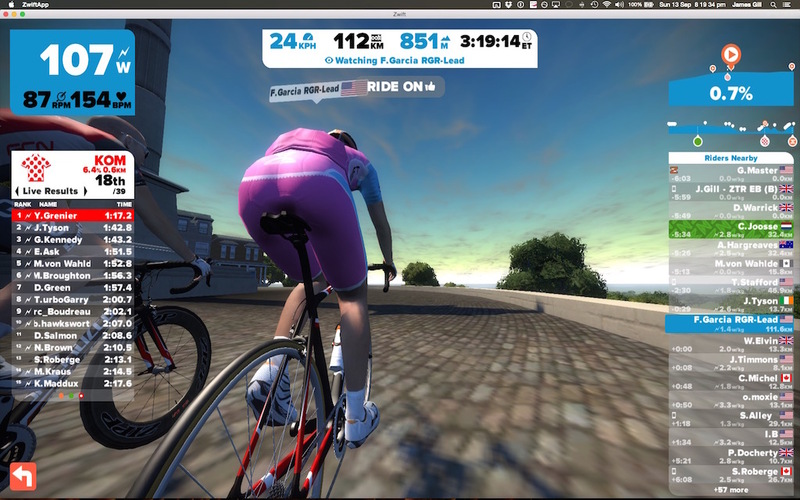 Not on Zwift’s Richmond course. You get a genuinely realistic representation of the course which allows you to plan, and more importantly hone your tactics in a way that has never been possible before. As a result, I’ll personally be very interesting to see if there is any #ZwiftEffect apparent in the event times from teams that trained on Zwift. I tended this post to stand in addition to the Zwift User Manual. The User Manual contains the information on getting started on Zwift, and all of the little features of the game. This post is in addition, to look at the new track, and the changes that have come with it ? 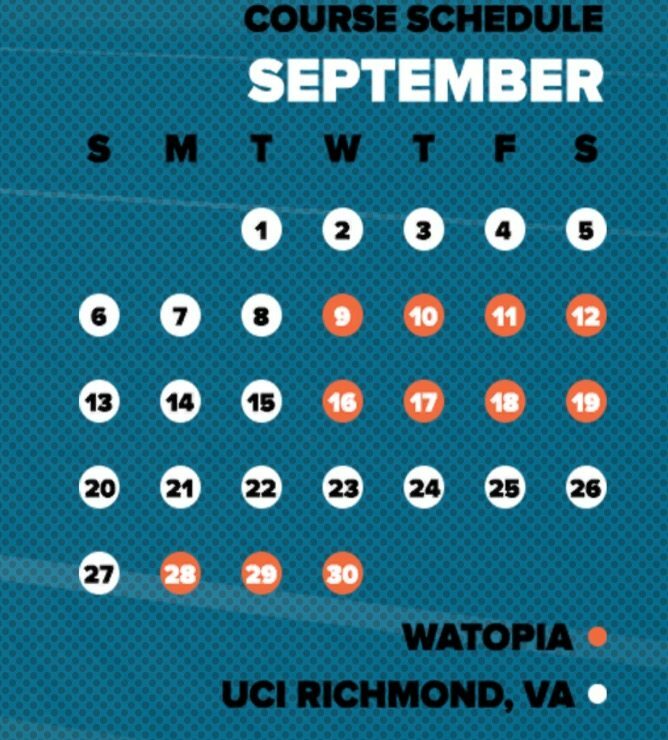 Zwift will change between Watopia and Richmond 2015 during the run up to the world championships starting. There is a handy schedule to know which course is going to be running on any given day of September on the log in screen. This might be of note for certain Zwift races. Everlasting “simply” involves cycling to cover 8,848m of elevation gain…in one go!! Yes you are allowed breaks for food, and other bodily functions, but you have to do it in one period without going to sleep. 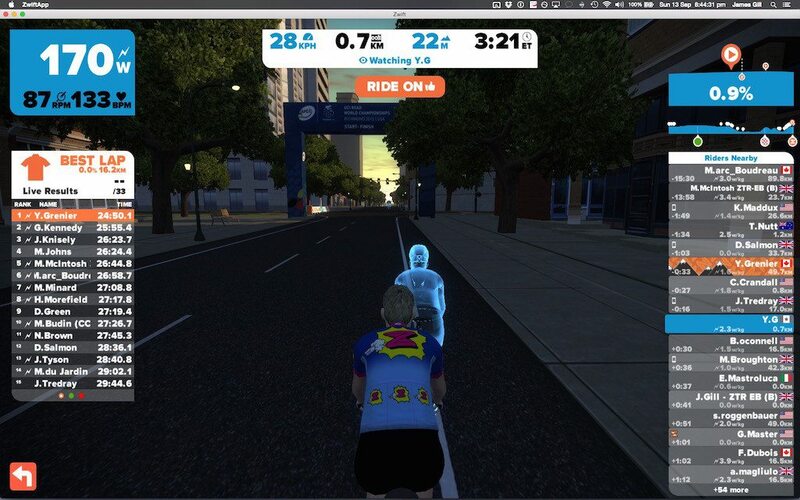 Thanks for the offer Zwift, but I think I value certain bits of my anatomy too much to try that! However, it doesnt appear that the Everest, or the Ride California are “one session” rides, but are things you can do over time, which makes them slightly more reasonable challenges. With less than a week left, I dont think I’m going to be completing it in my self imposed time frame. But hey IRL has a way of getting in the way. 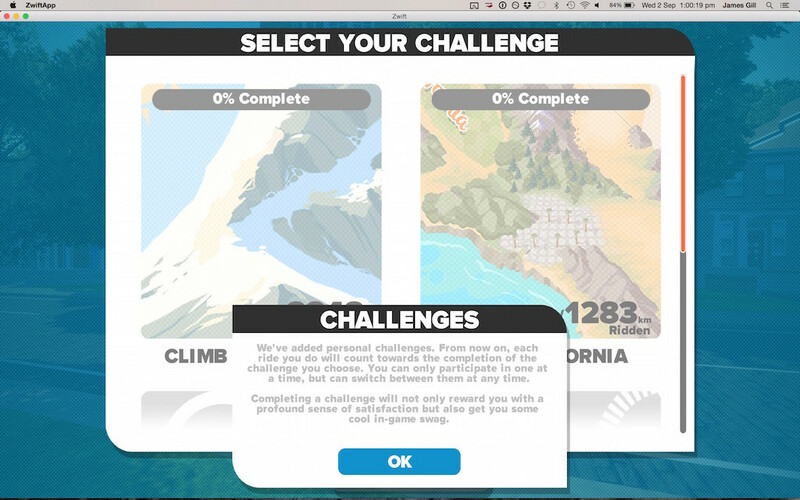 To change your challenge, select the challenge picture in the upper RIGHT part of the screen. One of the things I am VERY interested, is the unfilled boxes lower down the challenge screen, hopefully indicating more challenges are yet to come! 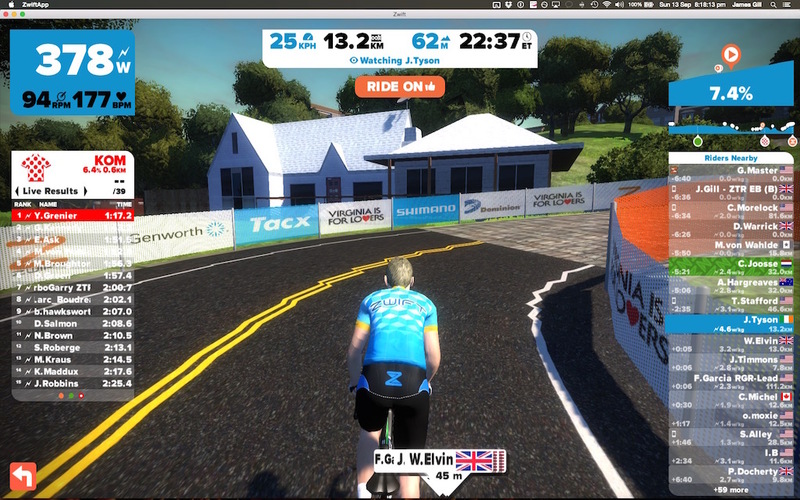 The lap distance on the Zwift Richmond 2015 course has increased compared to Watopia. With one Richmond circuit coming in at 16.9km, which gives plenty of distances to make interesting races. When you ride on the Richmond course, and compare it to real world photos from Google Earth its amazing how much effort the designers and course artists have taken to make things realistic. The course took 30 days to build, but given that the tools needed have now been created Zwift says that modelling other such courses will be a much faster endeavour. Even so, its not something I’d like to think I had been tasked with. Not only from the sheer work involved, but also making sure that the real world elevations and distances matched up, and its not much use creating a simulation of a course, if its not accurate. Accurate it certainly is. 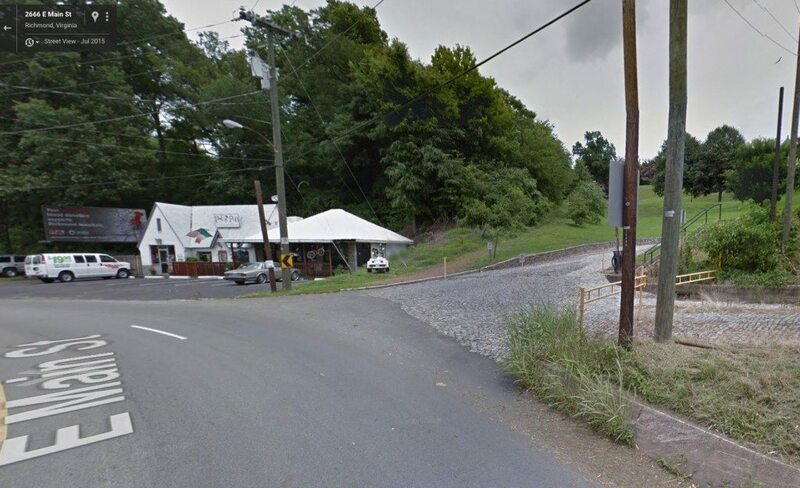 Yes there are no bill boards currently at the start of Libby hill, but I’ll wager someone will be able to get a very good comparison picture during race day! 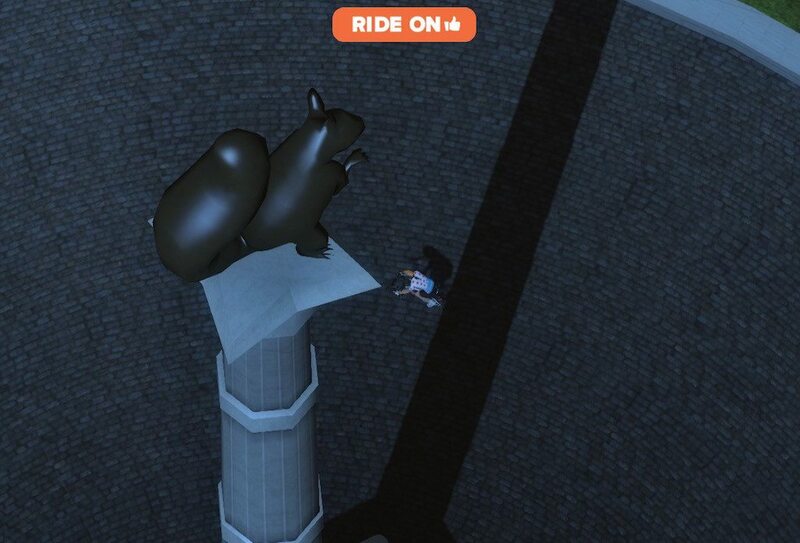 But we’ve not interesting the BOTTOM of Libby Hill, its the top where the challenge is – and also the Confederate soldiers monument, which has been replaced by a Statue of Zwift’s Scotty the Squirrel! ? The Sprint segment start 4.5km after the Ride On point, so you’re likely to have fresh legs on the first attempt. 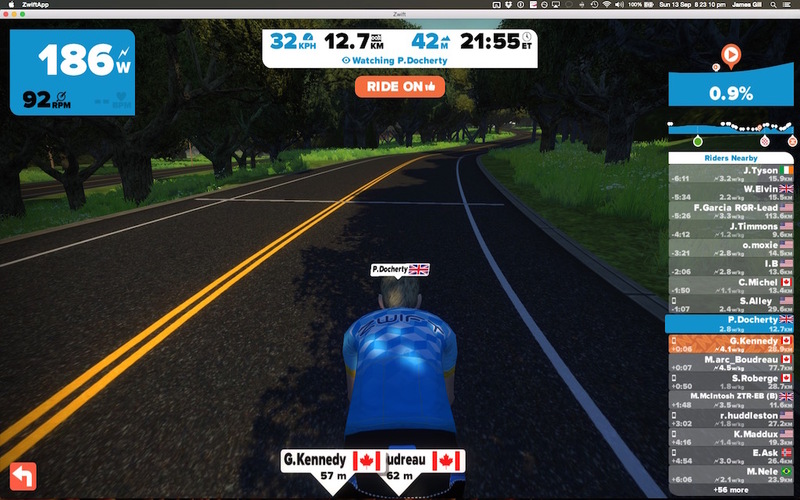 If there is ONE criticism I have of Zwift, its that the starts of Segments could be clearer. 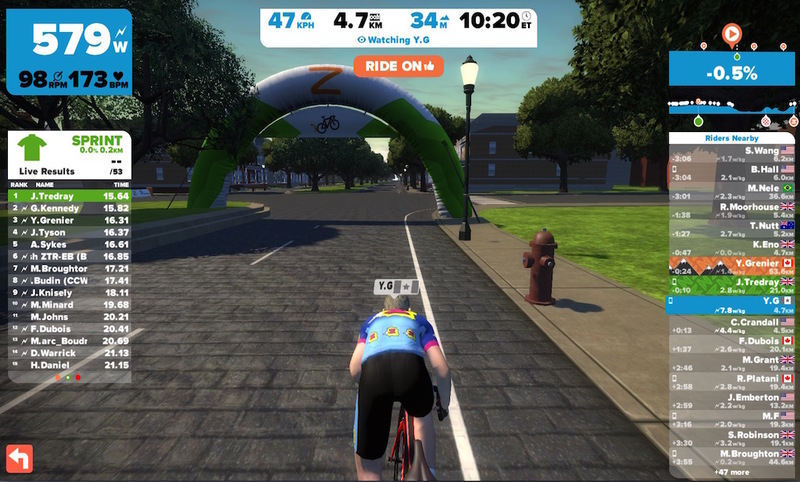 Zwift Richmond 2015 is their first reproduction of a real world track. When they next are building a track with road markings, it would be great if the segments were marked in a completely unambiguous way – perhaps double green lines on the road for sprint, and triple white, red and blue for the KOM starts. Just a thought. 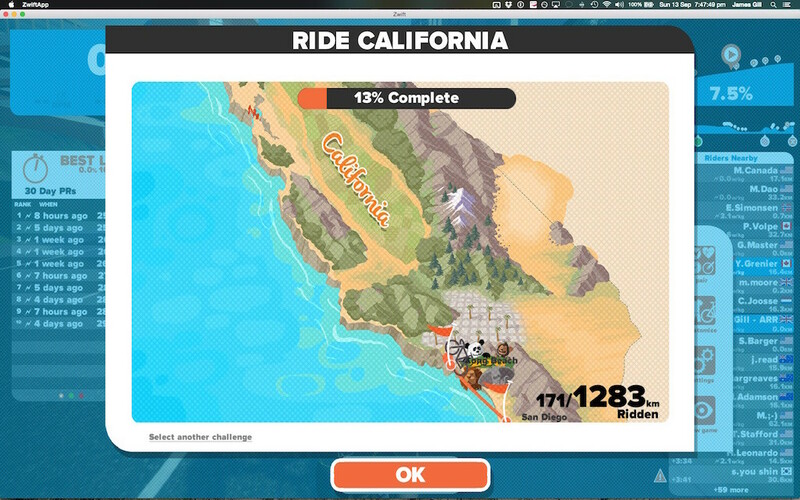 Watopia was a great course for Zwift to start off with, Richmond is an entirely new level, and difficulty too. The elevation profile shows what the pros are going to have to contend with in a few days time, and the two hills at the end of the course certainly hit hard when using Zwift – particular a certain 11.2% section of climbing! 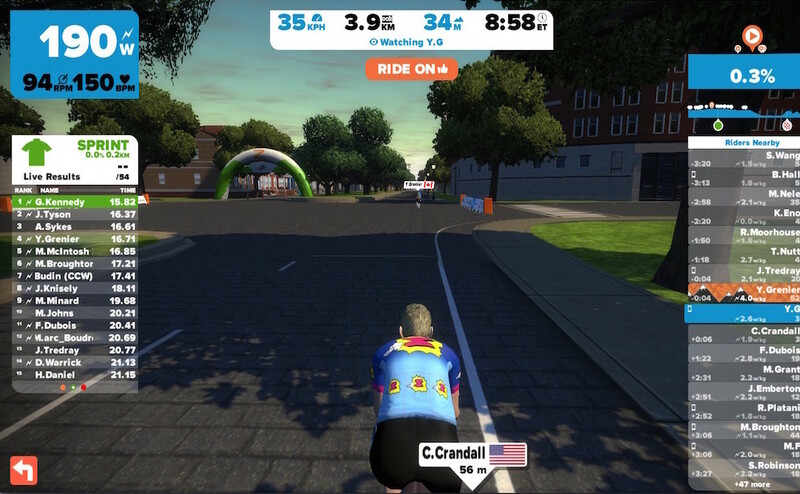 As the Richmond 2015 championships begins to pick up pace, its going to be really interesting to see the times that the Zwift riders are able to put in, and compare them to the pros. Yes they are pros and the majority of the Zwift guys are not, but this is the closest to the actual closed track many of us are going to see! 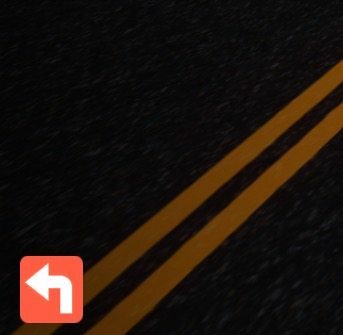 If you are wanting to get a taste of a race on Zwift Richmond 2015, there are many organised rides, mainly coming through the Zwift Facebook groups. I’ve already put a list of the commonly organised rides here on the site. 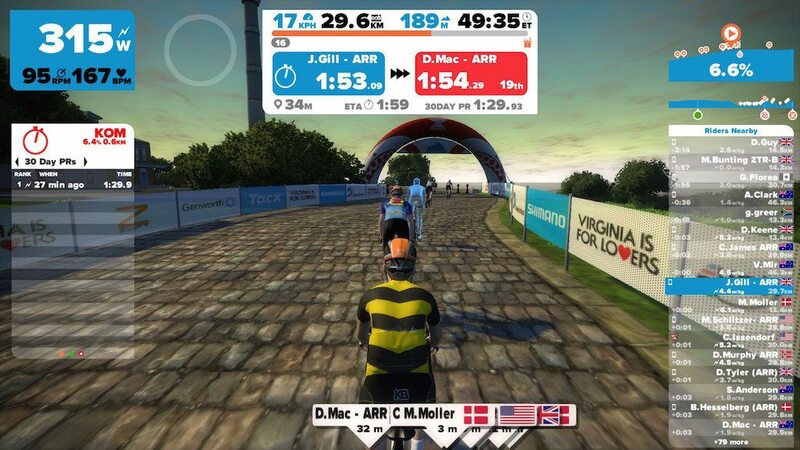 In addition, Zwift riders are organising a special Tuesday Night Worlds – Early Birds Edition on the 15th of September (18:30BST) to give the course a 2 lap thrashing. There are even rumours of be pro riders coming to test their legs on the 15th as well! ZTR EB ride! Every Tuesday 18:30 BST – Hey look, its the cobbles on Libby Hill! As ever, if you’ve got an opinion or comment, stick it below! Stryd Running Power Meter – Preliminary Review!